The David Weekley Homes Design Center is where all the fun of customizing your new home begins! Here, you will discover thousands of Custom Choices™ and find professional help from your personal Design Consultant. 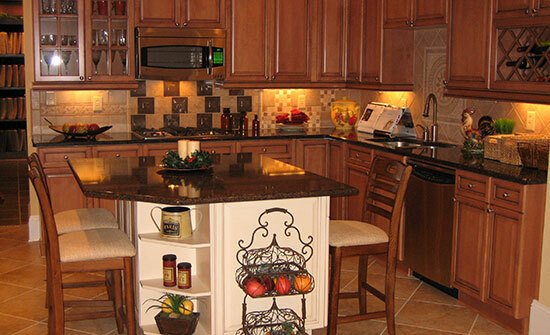 Cabinets, countertops and more – it’s all under one roof! With thousands of Custom Choices at our Design Center, your imagination can run wild! Whether you have a flair for modern design or love the look of something more traditional, we have something for every taste and budget. Our Charleston Design Center is open by appointment only, so please contact us at 843-654-5562 for scheduling. From I-526 westbound, take the Long Point Road exit, turn left and make a right at the light onto Wando Park Blvd. Take your 3rd left into the office complex parking lot. Circle around the parking lot to the building in the back. Our entrance is on the left side of the building. When coming from I-526 eastbound, turn right at the exit onto Long Point Rd., then follow the directions as indicated.